Costa Rica is a relatively new adventure sport to this country with origins in the rugged mountains of the Austrian Alps. What exactly is Canyoning you ask – Well, basically, you start at the top of a steep canyon that typically has a stream, or small river flowing through it. From there you descend through the canyon by any means at you disposal i.e. repelling, swimming, jumping, swinging, climbing, sliding and zip-lining! Whew! Because of Costa Rica’s extremely steep topography, Green Frog Adventures has access to literally thousands of amazing jungle canyons and here is the rundown on one of our favorites. Located deep in the jungled mountains surrounding Arenal Volcano (Costa Ricas most active Volcano) lies one of Costa Rica’s most impressive navigatable canyons. We’ll start the day early and with a hearty Costa Rican breakfast (we’ll be needing the calories) before we start making our way into the surrounding mountains. Once we reach our destination, the top of one of Costa Rica’s most magnificent canyons, your guides will teach you the basics of Repelling and some of the other necessary descending techniques that we’ll be utilizing throughout the trip. Once you have a good grasp of repelling it’s into the abyss for you! 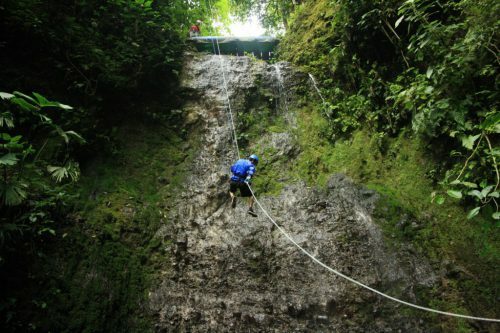 The first challenge is a breath taking 100ft waterfall! Once you take that first step over the edge, the rest is easy. As you make your way down through the refreshing mists thrown off by the beautiful waterfall thundering past you just a few feet away, don’t be surprised to see a monkey, sloth or toucan curiously watching you go by. Once you reach the pristine pool at the bottom, you can relax, take a swim and watch as the rest of your group descend through the misty jungle. Once the whole gang is down, the next adventure will be a 15 foot jump into the next pool. And so it goes for the next few hours as you make your way down through this amazing paradise.